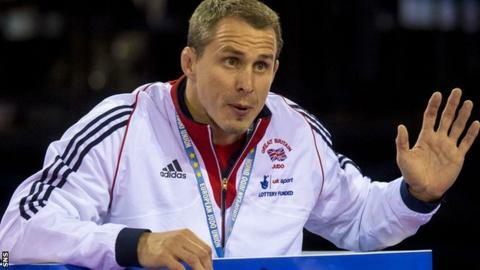 Commonwealth Games gold medallist Euan Burton has been appointed Scotland's high-performance judo coach. The 36-year-old takes over from from David Somerville, who led the team - including Burton - at the 2014 games. Burton, who ended his competitive career on a high by taking the half middleweight title in Glasgow, is relishing the opportunity. "I truly believe in the power of judo to make a positive impact on Scotland's people and its communities," he said. "I am, however, fully aware of the size and responsibility of the job at hand and do not underestimate the numerous challenges that we will meet on our journey." Burton, who was a world and European bronze medallist, thought that Somerville, who moves to a similar role with Sportscotland, was handing over a programme that is in "a strong position". Sportscotland director of high performance Mike Whittingham said: "Euan's credentials as an athlete need no elaboration, but he has also shown the same aptitude and dedication in his role as assistant high-performance coach. "The fact that he won Commonwealth gold while combining the two roles speaks volumes and is an inspiration to those who follow in his footsteps."